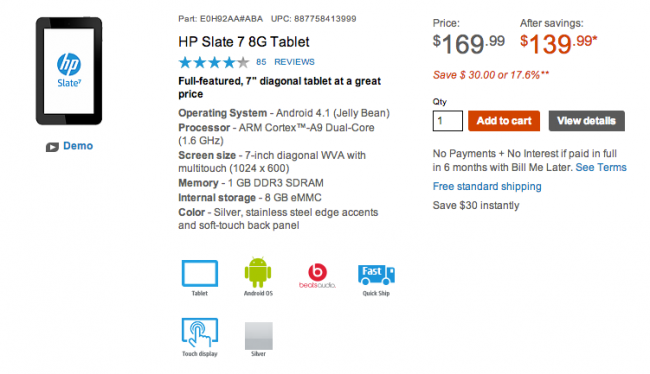 HP recently dropped the price for both of the Slate 7 devices in the Android-powered Slate lineup, bringing the total prices to a low $140 for the 8GB model and $170 for the 16GB variant. $30 across the board. Whether this move is to spark some movement in inventory or to make room on something else, it’s a buyer’s market out there in terms of tablet. The Slate 7 devices come shipped with Android 4.1, are powered by a 1.6GHz dual-core processor, sport a 7″ 1024 x 600 display (unfortunate) and host 1GB of RAM. They are weak in terms of specs, but with that price point, it is what it is. If you’re interested, you can grab one from the via link below.